A month or so ago I got a random urge to make tamales from scratch, so I did. 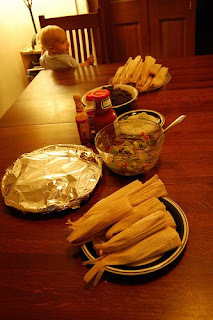 I doubt y'all want to make tamales from scratch, so I'll spare you the step-by-step (but it was actually really easy and they tasted great and I'll tell you how if you want). I wanted some quick and easy sides to serve with them, and the idea for this salad popped into my head, even though I do not eat avocados. Or raw onion. It's basically guacamole that's not mushed up, but Stacey liked it so much that she requested I make it again a couple weeks later, so I thought it was worth sharing. Dice avocados into medium-sized cubes (cut them in half lengthwise, remove the large pit, use a small sharp knife to cut down into each half in a grid pattern, turn each half inside out, and easily cut the resulting cubes from the peel). Place cubes in a small glass bowl and add tomato and onion. Cut lemon in half and squeeze both halves over avocado mixture (I put my hand underneath to catch the seeds and let the juice run through my fingers). Sprinkle with 1/2 tsp of sea salt or other coarse salt. Voila!